You've probably heard it before - the eerie wail of a tornado warning siren. You know what they sound like and what they are there for, but what do they really mean and what should you actually do when you hear them blaring? Get inside? Get in the basement? Actually, both of those are ideal actions to take. However, unless you actually see a tornado, the best action to take is to immediately turn on your TV or radio and tune in to a local news station to see what's going on. Cities, counties and communities install these devices for one purpose - to warn those who are caught outside and help save lives. 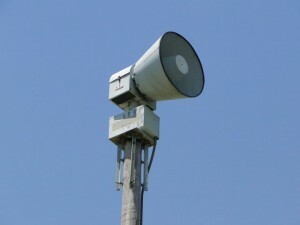 That's why they are called "outdoor warning sirens", to warn those who are outdoors. Although you may be able to hear them inside your home, they are not meant nor designed to be heard inside your home or workplace. That's why you should highly consider purchasing a NOAA All-Hazards Weather Radio. These life-saving devices usually run anywhere from $20-$50, and can usually be found at your local supermarket or Radio Shack. They may seem a little expensive, but believe us - they are well worth the money that you will spend on them. Sometimes before tornado season begins, some organizations (including local news agencies) will offer them for sale at local public places at a discounted price, and will sometimes even program them for you at no cost. Think of this device as your own personal tornado siren - when a weather warning is issued for your area, it will emit a loud beeping sound and tell you both by voice and its display what kind of warning was issued for your area. You will thank yourself for purchasing one the next time a tornado warning is issued while you are asleep. We hope we never have to use it again, but we will not be hesitant to use it to good use in the future. 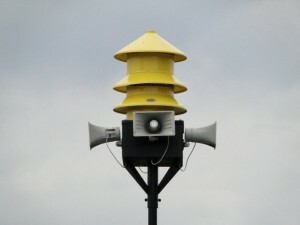 We have recently installed a larger and much louder warning siren to cover residents near our area. This rotating, supercharged siren will cover a large 3-5 mile radius compared to the smaller unit that was previously used. The siren will be used for tornadoes, hazardous material alerts and nationwide emergencies. When the siren sounds (other than scheduled testing) you should immediately tune to a local TV or radio station for further information. If you see a tornado, don't hesitate or observe it; take shelter immediately. We will run a test of the siren every third Wednesday of the month at 12:00 noon along with the City of Dickson's siren, weather and time permitting. We will test both the steady and wailing (tornado warning) modes during that time. The test will last approximately 3 minutes. We will also test each of the siren's motors individually every Saturday at 12:00 noon. This particular test will be very short and will not be audible. Below is a video of what our siren sounds like. In a real tornado situation, the siren will sound the wailing signal for 3 minutes.